HearSay 2015. The Blind Experiment. It all started with a stray comment down the back of a cookery demonstration. 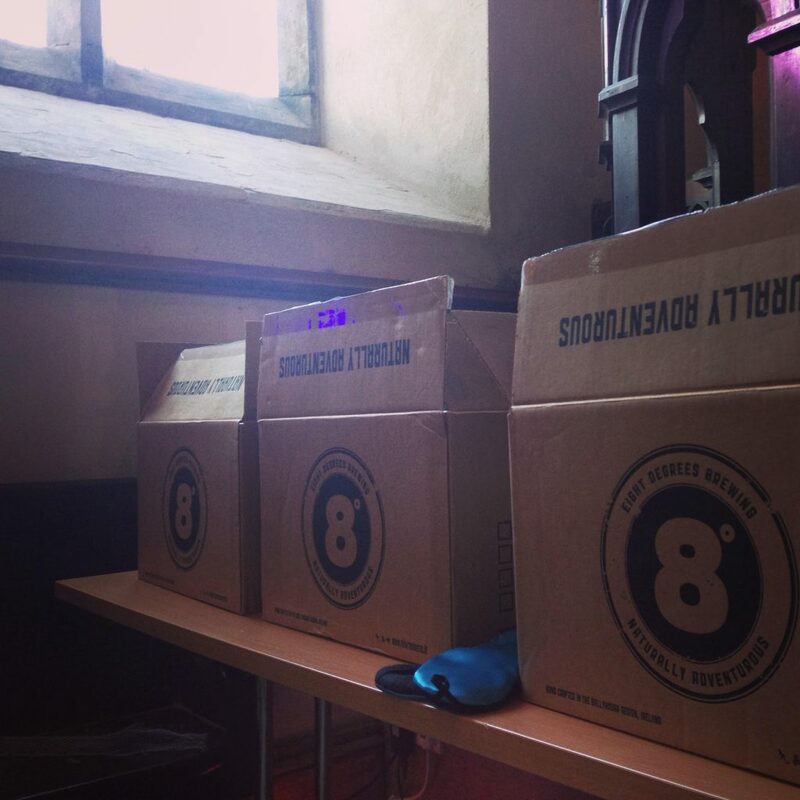 As I talked whispered, Diarmuid McIntyre, of Grey Heron Media and the HearSay Festival, through a beer tasting, he wondered if it would be possible to do something with sound and beer. And I was caught, caught in a research spiral of sound and taste and theory – but it wasn’t until an inspirational friend suggested a musical collaborator that I had something to build on. Step forward Brian Leach, musician, sound artist and astrophysicist. And a man who doesn’t shy from a challenge. Skip forward a couple of months to a cold, cold church in Kilfinane on a bright Saturday afternoon. Brian and I are on stage. 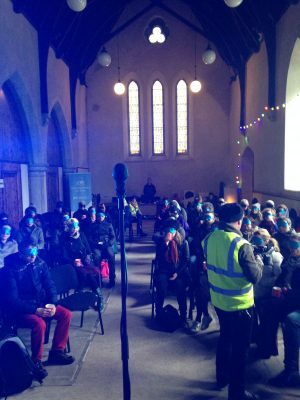 We have 50 blindfold people in front of us and an assortment of beers ready to taste alongside a soundscape of carefully composed and chosen pieces, from variations on Chinese folk music to Brian’s take on the traditional Eibhlín A Rún. We were on at 12pm and lots of people I met the previous night had promised to be there. Having said that, a lot of these conversations had happened in the pub approximately 12 hours earlier! On the way there, I figured that there were two kinds of people who would go to this kind of event: the ones who were intrigued by the sound side of the Blind Experiment – and those in search of the cure. I needn’t have worried. We had set out 50 seats + blindfolds for participants; there weren’t many spare spaces. I have to say that standing on a stage in front of 50 blindfolded people, patiently awaiting the next instruction, is an incredible feeling of power. Don’t worry! I wielded that power wisely and well. And took the opportunity to have a little jig on the stage while no one was watching. It’s difficult to stand still to Brian’s music. Did we manage to make people taste things differently through the sounds that we played? The experiment had some rather intriguing results. We might need to repeat it a few more times before any final conclusions but it’s safe to say that the words our participants used to describe the flavours correlated fairly closely with the list of ideas and terms that Brian and I worked on together. Check out www.brianleach.ie for all the music that we used and to keep up to date with the talented Brian, who also plays on albums with Torcán (trad), Palko (rock) and his solo release, Banjo Brino. Many thanks to sound engineer Darren from Big Bear Sound, Dan and (the other) Brian – aka my 6’6″+ minions! – for all their help, the HearSay volunteers, Grey Heron Media for the blindfolds and all the HearSay team for letting us run with such a crazy, fun idea. The local beer came from Eight Degrees Brewing who, despite not being entirely sure what I was up to, supported me all the way. Just as long as I didn’t blindfold them. This time. Full details of the programme are online at MerrionSquare.ie plus online programme in PDF form is here. This, plus the talk that I’m doing, is all part of an event organised by The Merrion Square Innovation Network. Previous story HearSay 2015. Memories. Bibliocook - All About Food > Work > Radio > HearSay 2015. The Blind Experiment.